One of the downright coolest pieces to come out of SIHH 2017 was the latest in the line of Horological Machines from MB&F (Maximilian Büsser & Friends); the jelly-fish inspired HM7 Aquapod. MB&F get a lot of time at TwentyTwoTen.com because of their undeniable enthusiasm and ability to push the boundaries. The mechanical watch industry is not in a time of mechanical innovation like we’ve seen in the past 100 years. The automatic chronograph, water-proof cases, screw-down-crowns, co-axial escapements, the tourbillon; all incredible and game-changing but old news. We are seeing improvements and refinement, but not entirely new mechanical technology. Innovation is obviously shifted to smart-watches. So when we see something so intriguing and confidently able to use technology in such a unique way; we are truley captivated. The MB&F HM7 Aquapod is actually the 8th release, the HM8 released in September 2016, and the first HM to draw design inspiration from the ocean. The 53.8 x 21.3 mm case features a water resistance of 50 m legible through the anti-reflective domed sapphire crystal. 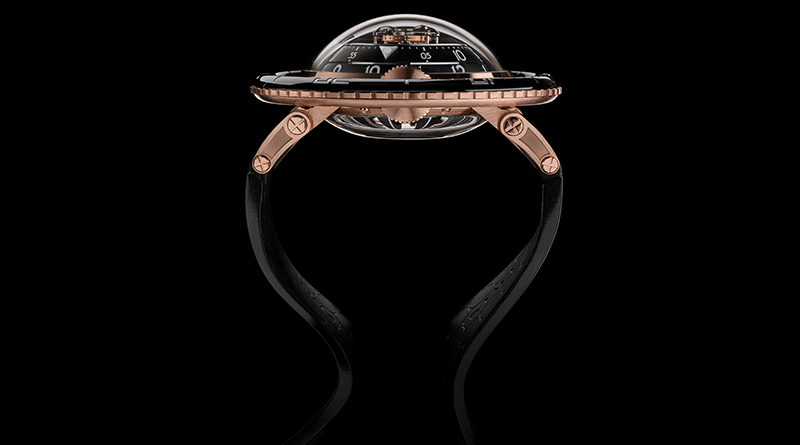 The engine driving this creature features a central 60-second flying tourbillon and an in-house, vertically stacked, automatic, 35 jewel movement. Drawing a common feature from other HM’s (LM1, HM4 and HM6), the movement features two opposing crowns; one to wind the movement and the other to set the time. The titanium automatic rotor has platinum tentacles to give it weight and is finished with a stripe of lume, making this a beautiful sight in the dark. To read this piece, it is easiest to first view this video and then read the following: two curved rotating rings indicate minutes and hours which line up at an indicator at 6 o’clock. So, despite the relatively low water resistance of only 50m this is still a dive-watch. Therefore the ceramic bezel rotates unidirectionally to give you elapsed dive timing (that I’m positive and hopeful will never actually be used for diving) and extreme low light legibility with the hand-applied Super-LumiNova. An interesting touch is the 3 panels of AGT (Ambient Glow Technology) lume haloing the central flying tourbillon which can also be used as a seconds indicator. Although very large, the Aquapod lugs articulate with the wrist reducing its overall wearing size, which coupled with the elastomer strap will ensure a comfortable fit. The MB&F HM7 is currently available in two limited edition versions; 33 pieces in titanium Ref. 70.TSL.B (CHF98,000) and 66 pieces in 18K red gold Ref. 70.RLB.B (CHF118,000). At SIHH 2017 Mr Max Büsser himself announced that in 2018 MB&F will release another 33 pieces of titanium version of the HM7 with a green bezel.